The Bingham manages to strike that perfect balance between attentive and homely. 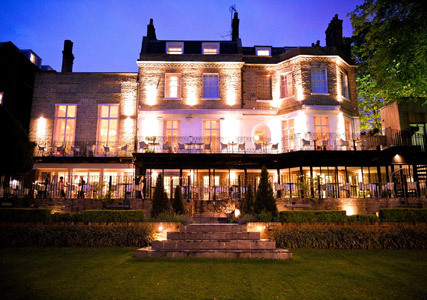 Sat on the banks of the River Thames in gorgeous, leafy Richmond is the restored Grade II listed Georgian townhouse that is home to The Bingham Hotel. I took my dear father there to try their set Sunday lunch menu, a steal, considering the location and standard, at £38 a head. And, as is the charm of me, and the perils of relying on public transport on a Sunday, I was running half an hour late. I needn’t have stressed. I found my dad (Sam, just so you know) relaxing by the open fireplace in the hotel’s bar, nursing a well deserved Campari and soda. After a scan of the impressive drinks menu, I opted for a glass of English sparkling wine (Nyetimber, Classic Cuvée), and it was good. 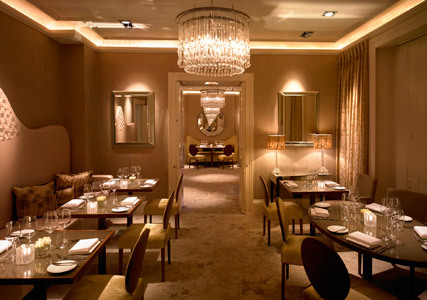 Having taken the edge off my public transport fluster, we were led into the restaurant, and what struck me was that although the decor on the surface was grand – teardrop chandeliers hung overhead and we sat on gold velvet chairs – the atmosphere was very homely. It had a very relaxed, family-friendly vibe. There were even some children there, although not in a shrieking, yelling, hideous way. It felt much like being in my own living room, if my living room were in a beautiful townhouse on the banks of the River Thames. The hours flew by as we made our way through the mushroom mousse and tarragon custard amuse bouche, followed by the creamy curried haddock risotto and roast beef with all the trimmings, all washed down with a bold Chilean cabernet sauvignon. Next up was the cheeseboard of dreams, made up of six delicious artisan cheeses from local supplier Teddington Cheese. All rounded off with a steaming espresso. I can’t fault the Sunday lunch menu at The Bingham and what I loved was that the portions were substantial but not bloating. I can think of no better place to spend a food and wine-fuelled Sunday afternoon. Dad liked it too.